On Wednesday March 18 the Saint Paul City Council voted to adopt the Draft Saint Paul Bicycle Plan. This has been a long time coming. Many of the local bicycle and pedestrian advocacy groups put out a call to get cyclists to show up. It worked. For the first time, they had to put additional bicycle parking outside city hall for a City Council meeting, not that the Council got it arranged. 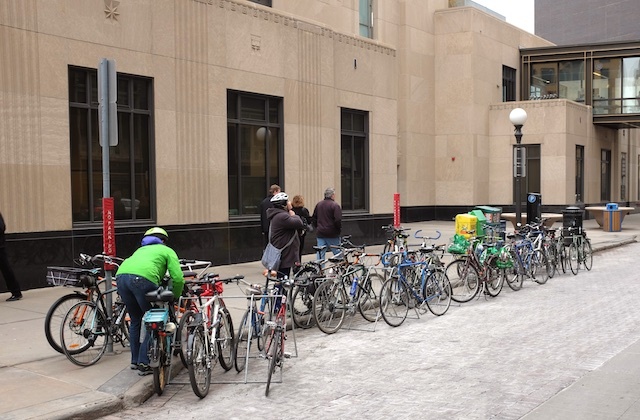 Bicycle Parking filling up fast outside City Hall on March 18. Having been to any number of neighborhood or district council meetings where the objections to bicycles range from "this will draw cyclists who will urinate in our front lawns" to "this bicycle trail will be too close to the RV parking I built over my property line onto city land" it was gratifying to be in the majority for a change. Each side had 15 minutes to speak. Ten people signed up to speak against, 28 to speak for, and people like me didn't even bother signing up when I saw how long the list was already. The Antis were mostly concerned with parking, particularly on Wabasha. There are rumors about of 150 parking spots being lost in the plan, though the actual number hasn't been determined, and longstanding businesses like CandyLand note that people going into their store aren't going to pay $10 to park in a ramp to buy $2 worth of candy. Putting aside the fact that you can park cheaper than $10 and it's hard to get out of CandyLand for $2.00, they probably have a point. 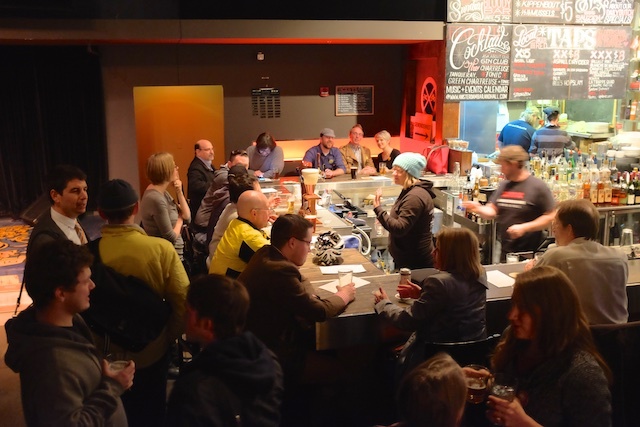 The City wasn't concerned about the slow strangulation of several businesses along University triggered by the building of the Light Rail line and the subsequent loss of on-street parking. Various promises about trying on-street parking on University once Light Rail was in have so far not been realized. Those worried about parking also may not realize that they have allies in the pedestrian world; on-street parking means endless door zones for cyclists, but is a welcome buffer from fast-moving traffic for pedestrians on the sidewalk. When everyone was done saying their piece, the City Council voted to adopt the Bicycle Plan. Since not all the Antis had time to speak, they'd had everyone who had come to speak against adoption of the Bicycle Plan stand to get a sense of the numbers. It looked like they were about to wrap up without doing the same for the Pros. A prompt from the audience rectified this, and the Council had us stand. Supporters of the Saint Paul Bicycle Plan stand in the kind of cool Art Deco City Council Chambers. The Chambers emptied after the vote and heaps of us went down to the Amsterdam Bar & Hall to celebrate. A worry of many businesses is that cyclists don't spend any money. We did our bit this night despite the hurdle of the Amsterdam's credit card system being down. I had a couple of beers and a bowl of mussels and fries, then took my leave from the merry bunch, walked back to work, changed, and rode home. Some of the happy crowd at the Amsterdam Bar after the City Council meeting. It has taken a long time to get to just this point, and it was a happy evening to be in the majority for once. However, there is lots of work still to be done. Some non-controversial aspects of the Plan will undoubtedly go in without any problem, but other proposals will cause a ruckus. There will be more public meetings, outraged groups, worries about cyclists urinating in front yards, demands to preserve free parking, worries about how it will affect the children. We won't always have that happy majority at these meetings, but it sure felt great for this one evening.